Trump signed an executive order Friday that imposed a 120-day suspension of the refugee program and a 90-day ban on travel to the U.S. from citizens of seven terror hot spots, including Iraq, Syria, Somalia and Sudan. The order sparked chaos at the nation’s airports as customs agents struggled to interpret the order, and outraged civil rights groups and Democratic lawmakers -- some of whom attended protests at the nation’s airports where some travelers had been detained. 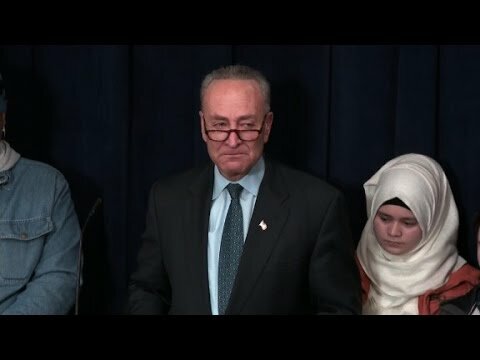 On Sunday, Schumer struggled to hold back tears at a press conference as he called the order "mean-spirited and un-American." Trump was referring to a Delta systems outage Sunday night that led to a number of delays. However the chaos began Saturday, and so most of the chaos was not related to the outage. After promising again to “Make America Safe Again” he reminded his Twitter followers that “there is nothing nice about searching for terrorists before they can enter out country” and urging them to “study the world!" He later doubled down on his criticism of Schumer, telling reporters after a White House meeting with small business owners that he thought "there's about a 5 percent chance [the tears were] real." "I noticed Chuck Schumer yesterday with fake tears," Trump said. "I’m going to ask him who is his acting coach." Trump aide Stephen Miller also defended the move Monday morning, saying on Fox & Friends that the list of countries was from a list drawn up by the Obama administration, and that the move was a preventive measure to stop terror attacks like those seen in Europe. "Our task in this new administration is to prevent what happened in parts of France and Belgium and Germany from happening in the United States," Miller said. "Where you have large pockets of radicalization that extend through generations and that become a long-term security problem." Responding to criticism that the order had been dropped on agencies with little-to-no warning, both Miller and Trump said that a window would have allowed potential terrorists to come in before it closed. The Trump administration was forced to make a number of clarifications on the status of permanent legal residents or “green card” holders, while a federal judge issued a stay on deportations late Saturday.